NASA’s Origins, Spectral Interpretation, Resource Identification, Security-Regolith Explorer (OSIRIS-REx) spacecraft has successfully arrived at its destination, the asteroid Bennu. Following a review held at 11:15 am EST (4:39 p.m. GMT), a panel composed of four mission team members and led by moderator Michelle Thaller of NASA’s Goddard Space Flight Center in Greenbelt, Maryland, discussed the goals set out for OSIRIS-REx and answered public questions between 11:45 am and 12:15 p.m. EST from mission headquarters at the Lockheed Martin Space Facility in Littleton, Colorado. This mission will mark the first American asteroid sample return and the largest space sample return since the Apollo Moon missions. “The OSIRIS-REx team is proud to cross another major milestone off our list–asteroid arrival. Initial data from the approach phase show this object to have exceptional scientific value. We can’t wait to start our exploration of Bennu in earnest. We’ve been preparing for this moment for years, and we’re ready,” emphasized mission principal investigator Dante Lauretta of the University of Arizona at Tucson. It is planned to have the probe fly past Bennu’s poles and equator over the next few weeks as it measures the asteroid’s spin rate, determines its mass, and defines its shape. This data will be used in the eventual selection of a landing site. 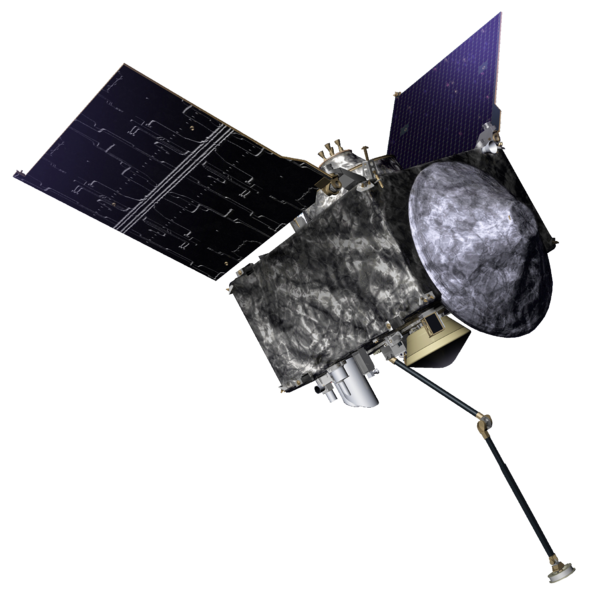 On Dec. 31, OSIRIS-REx, now 11.8 miles (19 km) from the side of Bennu facing the Sun, will enter orbit around the asteroid. Over the next year, OSIRIS-REx will orbit Bennu, which has a diameter of approximately a third of a mile (half a kilometer) at its equator, and is composed of materials dating back to the solar system’s earliest days. Using its five scientific instruments, the spacecraft will study the asteroid with the goal of finding a safe and scientifically interesting landing site. Once a site has been selected, it is planned to have OSIRIS-REx touch down and use its robotic arm to collect surface material. It will conduct as many as three sample-collection attempts with the goal of obtaining a minimum of 60 grams, which will be stored in a sample return capsule that scientists plan to be sent back to Earth in March of 2021 on a two-and-a-half-year journey, with the return scheduled for September 2023. Before entering Earth’s atmosphere, the capsule will separate from the spacecraft, then land at the Utah Test and Training Range, from where it will be retrieved. Between 2023 and 2025, scientists hope to catalog and analyze the samples. Some 75 percent of these will be housed at NASA’s Johnson Space Flight Center in Houston, Texas, for study by future generations of researchers. Asteroids like Bennu are composed of the solar system’s building blocks, which formed the rocky planets. Many contain water, organic materials, and metals. Bennu is also classed as a potentially hazardous asteroid because it makes a close approach to Earth about once every six years. Researchers hope OSIRIS-REx will provide insights into possible phenomena that could push Bennu into a trajectory closer to Earth. Scientists think Bennu broke off from a larger, carbon-rich asteroid sometime between 700 million and two billion years ago when its parent body, estimated to have been 60 to 130 miles (100 to 200 km) in diameter, was struck by another asteroid in a catastrophic collision. OSIRIS-REx launched from Cape Canaveral, Florida, in September 2016 and traveled 1.2 billion miles (2 billion km) before arriving at Bennu on Monday, Dec. 3. On approach, the spacecraft captured a high-resolution image of its target on October 29, 2018, from a distance of approximately 205 miles (330 km). Combining eight separate images taken that day, the mission team released a “super-resolution” photograph of the asteroid.